Recently, I went into a pet store where samples of Free Range Dog Chews' natural dog treats were being offered to dog passers-by, and well, my dog was at home... so I tried them. 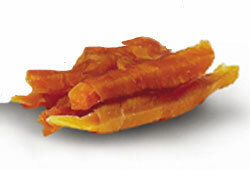 Amazingly, the dried chicken tasted like dried chicken, the dried sweet potato -- a very hot item now! 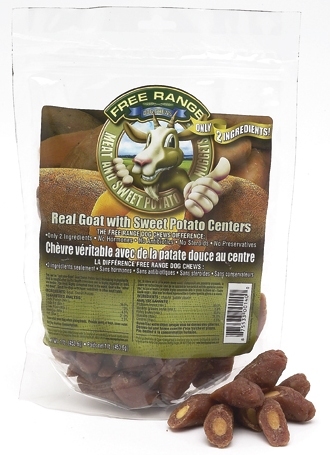 - tasted like a dried sweet potato, and the dried apples and bananas... just as advertised. Chewy too! Now, I'm not saying I would make a habit out of eating these dog treats, but they are made with human grade ingredients. And besides, if I didn't taste them, I wouldn't believe they were all that great. Yes, I bought him a few bags. Oh man, did he go wild! I love giving him stuff he likes. You want the ingredients? Free Range Chicken Breast and Apple. Nothing else. Also comes in nothing but Free Range Chicken Breast Wrap With Banana, if your pup prefers the sweeter fruit, and the Free Range Chicken Breast Wrap With Kiwi. You guessed it: nothing else. No water, no sugar, no spices, no string of chemicals; just food. 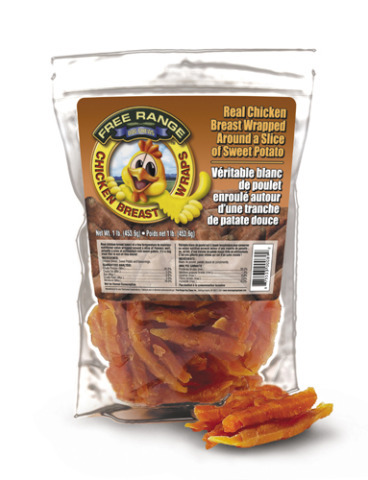 For veggie lovers, there's the Free Range Chicken Breast Wrap With Carrots, Free Range Chicken Breast Wrap With Water Chestnuts, and (my favorite) the Free Range Chicken Breast Wrap With Sweet Potato. Just the foods described in the names. 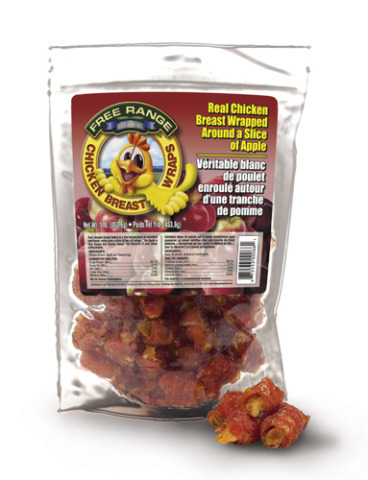 come in five varieties of meat that dogs go nuts over: beef, lamb, goat, duck, and rabbit. Free Range Dog Chew products are all 100 percent natural. Even their bully sticks and beef knuckles, and bones come from free range animals that are 100 percent grass fed in Brazil. Everything that comes into the U.S. has to pass rigid requirements and each product is tested in a U.S. inspection laboratory. You can see lab tests conducted on each product batch on the Free Range Dog Chew website. See the company's list of products on Amazon.com.